This Saturday, April 26th, the Chi Phi Fraternity – Pi Theta Chapter of UW-La Crosse will be hosting Sara Softball 2014, the 2nd Annual LAX Violence Awareness Charity Softball Tournament. This tournament is held in memory of Sara Hougom, a West Salem native and Western Technical College student, who was shot in her apartment by an intruder. Proceeds from the tournament are used to support initiatives that promote violence awareness and prevention in La Crosse and surrounding communities. 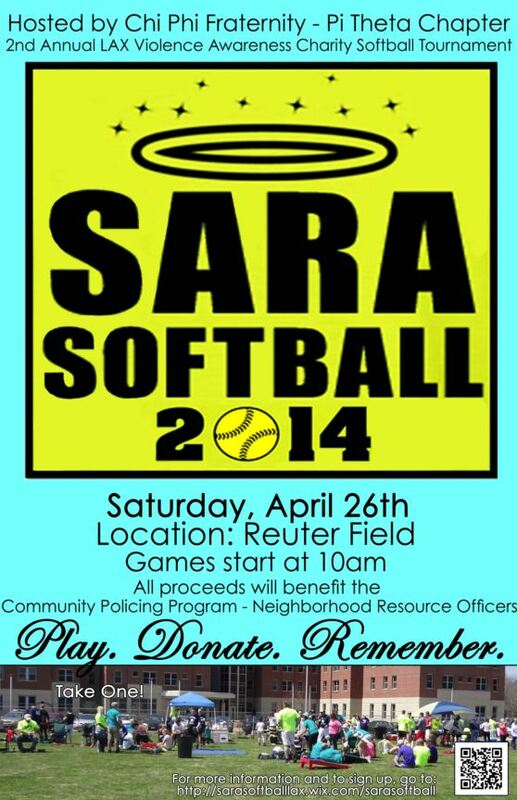 To learn how you can support Sara Softball, visit the Sara Softball 2014 website, or contact the Chi Phi Fraternity – Pi Theta Chapter at SaraSoftballLAX@gmail.com. You can sign-up to play, buy a Sara Softball Tee, become a sponsor, or donate! For the second year, members of the La Crosse Police Department have formed a team to play. We look forward to seeing you at Reuter Field this Saturday!